CNN’s Jon Klein, in an internal memo obtained by the TVNewser blog, bragged about the strong ratings the network won during its recent debates and primary coverage, and spun the reason for this success. "CNN is proving that with innovation, execution, and passion, the sky's the limit. Our deep-seated commitment to independent coverage that is unbiased — without an agenda — is more powerful and popular than the partisan rants that permeate the airwaves." Klein might have had Keith Olbermann in mind when he referred to "partisan rants," but one would only need to look at the past three months to disprove such an outrageous claim by Klein. The first and most egregious example of CNN’s bias occurred at their joint debate with YouTube at the end of November 2007. 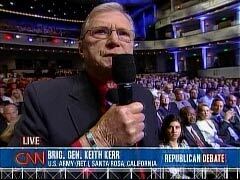 Retired general Keith Kerr, a member of the "LGBT Americans For Hillary Steering Committee" and an open homosexual himself, not only asked about homosexuals serving openly in the military played at the debate via his Internet video, but was also present at the debate to follow-up with the Republican candidates personally. For a week, CNN and its operatives denied that they knew Kerr’s affiliation with the Clinton campaign, and even some in the mainstream media, such as Tim Rutten of the Los Angeles Times, slammed CNN for "this most recent debacle masquerading as a presidential debate." General Keith Kerr IS a general! Our purpose here at Newsbusters is to chronicle and expose the leftist media bias that infests their coverage of the news, that is true. But, I feel compelled to also urge that our efforts be as true and guided by integrity as possible. The retired general who quizzed Republican presidential candidates about gays and lesbians in the military was not the only person linked to a Democratic presidential candidate who got to ask a question at Wednesday’s CNN/YouTube debate. CNN also aired questions from supporters of Democratic candidates John Edwards and Barack Obama. And that’s fine by the network, which is standing by its question selection process and lashing out at critics who say the debate demonstrated CNN’s liberal bias. “We’re focused on the questions, not the questioners,” said Sam Feist, CNN’s political director. Co-host John Roberts not only reported on Kerr’s membership of Clinton’s “LGBT Americans For Hillary Steering Committee” during all 3 hours of “American Morning,” but conducted a live interview of Kerr during the 7 am Eastern hour. Six minutes into the 6 am Eastern, Roberts gave the following brief on the Kerr story. Should CNN Be Allowed to Host Any More Debates? In the greatest of ironies, after Democrats refused to participate in debates sponsored by Fox News due to its supposed partiality, CNN has now shown itself in back-to-back debates to be as biased as biased can be. After either participating in or allowing the planting of campaign operatives at November 15's Democrat presidential debate in Las Vegas, it has now become apparent that similar stocking of audience questioners occurred in Wednesday's Republican debate. As NewsBuster Matthew Balan reported Wednesday, "a member of Hillary Clinton's "LGBT Americans For Hillary Steering Committee" not only asked a question via YouTube, "but he was also present in the audience, and got to ask the candidates for a ‘straight answer.'"